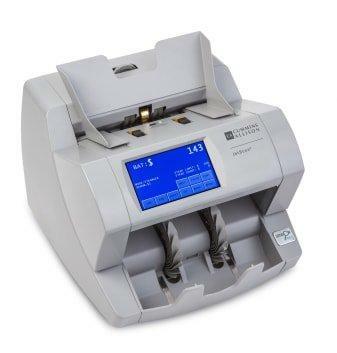 The iFX i400 is the Smallest, fastest, most flexible multi-pocket currency sorter available. The JetScan iFX i400 can have as few as 3-9 pockets all in the same footprint, or up to 17 pockets in a linear configuration, making it 64% smaller, 39% faster and more flexible than any other multi-pocket currency sorter available. Process deposits or any large volume of currency at up to 1,000 notes per minute. Faster currency processing plus imaging on one device. The JetScan iFX i200 currency counter and scanner offers 20% faster currency processing with 2 fully functional pockets for increased productivity. Count, image, sort and face mixed currency at an industry-leading speed of 1,200 notes per minute. Minimize the time employees spend counting cash using the fastest two-pocket currency counting machine available. Simplify currency and check processing using a single device. The JetScan iFX is the latest technology and the fastest, most accurate currency scanner available. The JetScan iFX i100 processes 1,600 notes per minute - 33% faster than other equipment. With fewer jams and advanced counterfeit detection, it's the fastest, most accurate currency scanner around. Designed for simple software upgrades, you can add serial number capture, check imaging and other document processing features as your needs change. JetScan two pocket currency counting and scanning machines offer you greater productivity because having two full capacity pockets allows for a second processing pocket or a location for a reject pocket. This allows for two or more currency counting and processing functions to be combined for maximum productivity. JetScan currency scanners can count and sort mixed money, face and orient bills and will stop on an exact bill. While counting one denomination, JetScan will stop when any other bill is processed. A $20 is never counted as a $1, which eliminates errors, speeds processing and frees operators to focus on other activities. JetScan currency counting and scanning machines offer you greater productivity because they automate many cash counting tasks that are time consuming to do by hand. The JetScan one pocket currency counter quickly and accurately identifies the denomination of each and every bill - at speeds up to 1,500 mixed bills per minute. JetCount cash counting machines are budget-friendly machines that are reliable, compact and easy to use and save valuable hours normally spent counting money by hand. At selectable speeds of up to 1,600 notes per minute, JetCount currency counters make quick work of even the highest of volumes of cash, dependably and accurately.